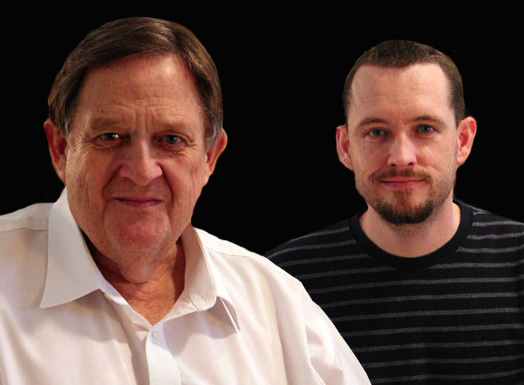 In this exclusive audio interview Emmy Winner Charlotte Robinson host of OUTTAKE VOICES™ talks with father and son authors Ross and Ryan Poore about their new novel "The Blood Doctrine" that addresses homophobia and the Mormon Church. This courtroom thriller explores the life of a missionary man whose chosen path is to spread the word of his Mormon religion and the motivations that drive him to brutally murder a gay man in the name of his faith. Utilizing the tool of fiction, Ross and Ryan Poore who are fierce gay allies, explore historical text, documented sermons and the teachings of Brigham Young, Sidney Rigdon, John D. Lee and others within the LDS to unravel the extremist anti gay position of church members and teachings that continues today. In addition “The Blood Doctrine” explains how The Church of Jesus Christ of Latter-day Saints strategically raised millions of dollars to pass California’s Proposition 8 in 2008. Ross Poore is the son of a coal miner and has earned four degrees from the University of Utah with a doctor's degree in educational leadership. He has served as a high school principal, counselor and teacher. His last professional years were spent as an academic director at a psychiatric treatment center for adolescents. He has been married to Chris for 45 years and has two sons and one grandson. Ryan Poore has worked in the media and entertainment industry for well over 15 years. Because of his media experience he visualizes his stories as virtual film sets before he begins to write.